Yesterday I took Jessica and her friend to San Francisco for the Warped Tour. We took Bart like last time but didn't get a hotel room. The plan was to be at the Bart station at 9:15 to meet up with some more of Jessica's friends. Later I found out these "friends" were boys. Imagine that lol. So we got there and were getting our tickets and Jessica finds out they are already on a train, couldn't wait for the next one apparently. She was PISSED. 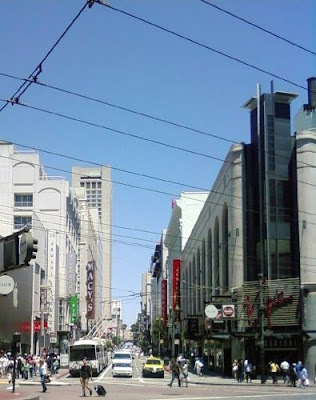 So we get to San Francisco finally and the girls get off at the Embarcadero Station, I told Jess to just follow all the other kids lol. She gets so turned around and lost so easily. I think I was the only parent there with kids going to the concert but I didn't think she could handle getting there on her own. So they get off and then I realize I have their tickets in my pocket. You need the tickets to get out of the train station! I get off at the mall and text her saying UMMM I have your tickets. She said they jumped over the thing that lets you out. Nice, we are felons I'm sure! I walked around the mall a bit and settled on some Panda Express for lunch. Then I hit the streets and walked around a bit. I went into Old Navy and got a bathing suit for $10, they had them on sale for $5 each piece! I didn't try it on though since the line for the fitting room was huge. If it doesn't fit I'll take it back here. I went into a bunch of stores and looked around but didn't buy anything else. Then I was just walking and wow what is that?? 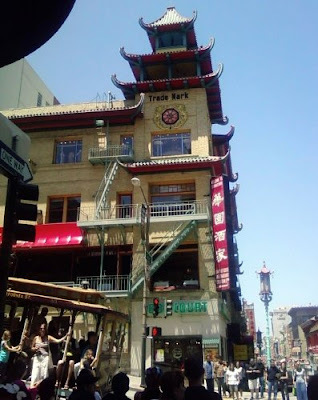 It's China Town! I think this was a bar, so odd in the middle of normal buildings! 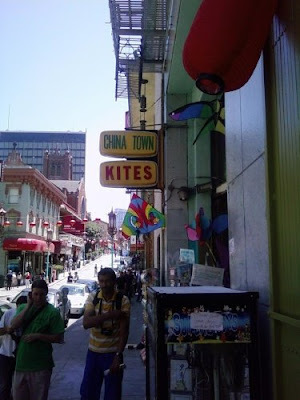 I went into the Kite Shop, the SMELL was overwhelming. Cool kites but it smelled so bad in there. 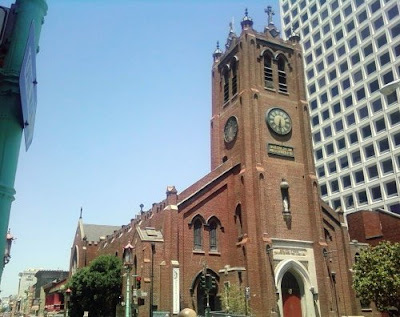 This church seemed a little out of place in the middle of China Town. 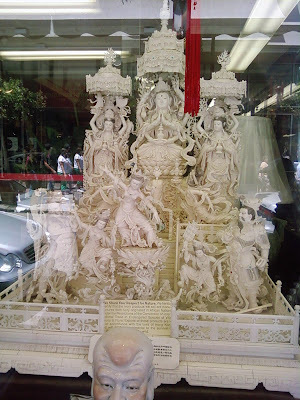 I was really intrigued by all these ivory carvings I saw in a bunch of windows. Apparently they are all "antiques". Like the light poles? Neat building too. Am I bright enough for you? 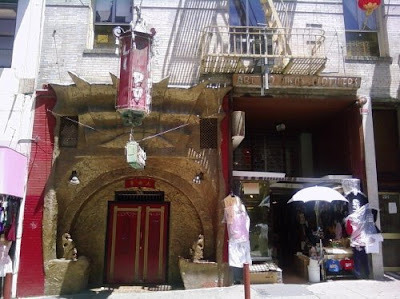 After you get to the end of China Town you can go to "Big Al's" and get your adult book store and video fix. and St. Patrick's Church I think it was. Sitting here I just felt so small. After wandering around a bit more I found this weird building that said it was a theater. I can't remember what it was called, but I went in and they had a movie theater in there. I checked the time and I was right on time to see The Proposal! I got a kids meal which was only $3 !?!? for a little popcorn, a good size drink and a BIG bag of candy. I'm still wondering if the girl messed up somehow. 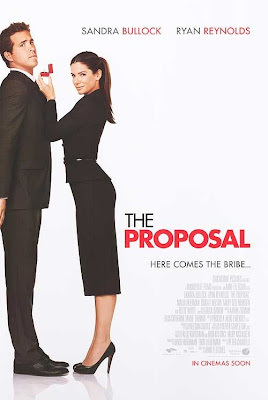 Sandra Bullock is HOT in this movie. She wears these fierce heels through most of it. I about died laughing with the dog/eagle scene. This is definitly a great chick flick!! Best one I've seen in awhile! When the movie was over I sent Jess a text and the concert was almost over so I made my way out to find the Bart Station. I went up a block and it was right there. I got on the train and got off at the girls' station and waited for them to come down. There were lots of kids coming down and everyone was burnt to a crisp. Finally after forever they finally came down and I handed them their tickets to get in, but they wouldn't work right because they were never shown as getting out of the station. If I was smart I would have just ran them through the machine. They had to go up to the attendant and she fixed them for them. We got on the train (with the boys, one of which I think is a new boyfriend) and it was packed and stinky. Thank God the stinky boys that I was sitting next to got off before too long. We stopped on the way home and had some dinner at In & Out (tried to go to Mimi's but there was no where to park!). We got home around 9 and then I took the girls to Jessica's friend's house to spend the night since they have a pool. Looks so fun! Thanks for sharing the photos - they're great! We will have to plan it in the future where Kacey goes with some of her friends to the concert and I can hang with you! Sounds fun! That movie was fun huh? Only Sandra can pull off a pony tail and look great the whole time! I like many of the bands on the Wrapped Tour but not enough of them to bother with it. And yes for some reason people have no clue how to prepair for an outside venue....lots of deoderant and sunscreen....duh! Sounds like everyone had a good day. I've been meaning to see that movie... and there is "something" about wandering around on your own, doing whatever strikes you. It's fun. Thanks for the tour. Such lovely buildings. 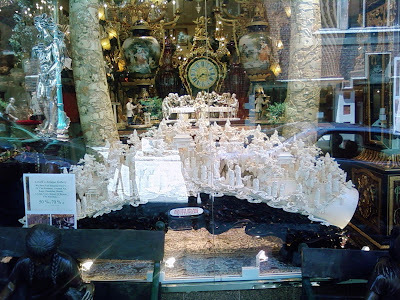 I did like those ivory sculptures!